Freshmap shows track rise/fall in properties and profile. Freshmap shows major DOC boundaries with description information. Cadastral mapping - property boundaries, "paper roads", identification of conservation land. Freshmap for Garmin GPS maps show DOC boundaries with a pale green line. 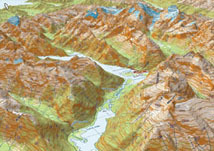 Below is an image of Freshmap in 3D mode. It's great for seeing the contours in the mountains.